Green may be the Plant Kingdom’s colour of choice, but it doesn’t have to be that way. In fact, it takes only a little chemical tuning to turn chlorophyll—the light-absorbing pigment that colours plants green—blue, red, orange, or any other hue under the sun. 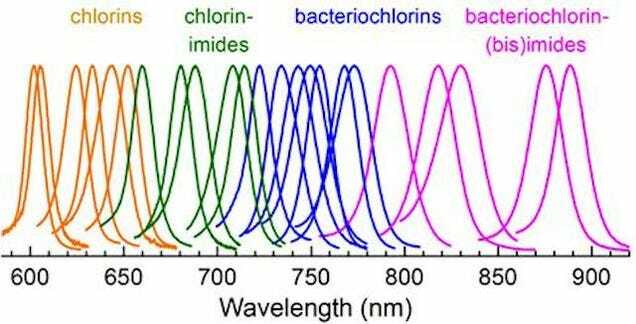 As reported in the Journal of Physical Chemistry B, scientists have recently figured out how to hack chlorophyll to absorb whatever colours of sunlight we like. Armed with new versions of the pigment, we might be able to engineer plants, or artificial solar cells, that can soak up far more of the sun’s energy than before. When chlorophyll—consisting of layers of cross hatched carbon and nitrogen rings—absorbs a photon of light, its electrons are thrust into a higher energy state. The difference between the energy contained in these electrons before and after absorbing sunlight determines what colours are absorbed and reflected. That difference, in turn, depends on chlorophyll’s molecular structure. After synthesising many different versions of the chlorophyll in the lab, three chemists worked out how to precisely alter the fraction of sunlight the pigment absorbs and reflects, by modifying the chemical structure of its rings. Naturally occurring molecules in the chlorophyll family, found in plants and bacteria, take on a number of different colours. Now chemists are able to fill in the gaps. So far, the team has managed to produce several artificial flavours of chlorophyll—pigments that absorb fractions of the sun’s energy plants can’t tap into. But the possibilities, they say, are near limitless. “If you come to us and say we’d like to have a molecule of this type that is going to absorb a narrow band of light centred on some particular red or near-infrared wavelength, say 750 nanometres, we could tell you how to synthesise one that will give the spectrum you want,” study co-author Dewey Holton said in a statement. In the future, we may be able to engineer plants with custom chlorophylls that access more, or different, parts of the solar spectrum than our naturally green varieties. Eating a blue or orange salad may take a little getting used to, but if hacking photosynthesis is going to help us feed our future population, we’d better start getting used to the idea. The full scientific paper can be found at the Journal of Physical Chemistry B.